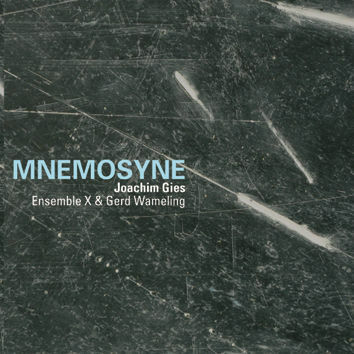 MNEMOSYNE is the ninth CD by saxophonist and composer Joachim Gies on Leo Records. This time he explores transitional environments: from air to tone, from spaces to rhythmic impulses, from sounds to language. Dynamic ENSEMBLE pieces frame texts by Friedrich Hölderlin and Franz Kafka, spoken by Gerd Wameling. Being the composer, Joachim Gies provides impulses for the interaction with ENSEMBLE X which create soundspaces simultaneously fragile and powerful. ENSEMBLE X is Gesine Nowakowski (soprano), Florian Juncker (trombone), Franz Bauer (vibraphone), Denis Stilke (percussion) and Joachim Gies (saxophone), of course.